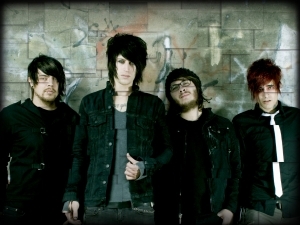 Avion Roe another band another dream but what sets this band apart from all the rest? Dallas, Texans Avion Roe released their debut full-length “The Art of Fiction” has one video out for the song “Who Am I…” and another on the way for the next single “The Difference Between Us”. Why are they here and how do they keep up with their fans that have been there since day one. Frontman vocalist Evan Lester explains “I see four young men who will not let anything stand in their way. I hope when people listen they won’t let anything stand in theirs.” Find even more interviews HERE. 1. Can you introduce yourselves and tell us what each of your roles in the band is and why did you want to call the band, Avion Roe? Evan: We wanted a name that would always have meaning to us. ROE stands for Rest Of Eternity, that’s how long we want this band to live on. 2. Give us a brief history of your band. Evan: Our band started on Jan 4th, 2011. We had thought we would be a five piece band but when we flew Jordan down to try out we knew we had it. We were immediately four brothers. We released our full length record in spring and jumped on the Vans Warped Tour. We shot a music video for our first single ‘Who I Am…’ and then jumped on a national tour with Madina Lake and Me Talk Pretty. We have had two songs on MTV and are shooting our second music video next week. This band is only beginning to unfold. 3. The band is from Dallas, Texas so does that mean that local cows and horses helped write your debut full-length? Evan: Ha-ha. Recording The Art of Fiction was such a cathartic experience; we tracked the whole record ourselves in our house. I started writing the album in 2009 and was so proud when we finished it. Our lives are on that record. 4. Where did the album title The Art of Fiction come from and what does it mean? Evan: The Art of Fiction was a name we danced around with for a while. We actually named our CD before naming our band. The name stands as a reminder that sometimes fiction can be the most accurate reflection of reality. Evan: I [Evan] write our songs. But I can’t take full credit, I couldn’t do it without the rest of the band constantly challenging and pulling the best out of me. Evan: I try not to do that. I would let them listen and make their own judgments. 7. Who are some of your musical and non-musical influences? Evan: The bands we like include The Used, Finch, Brand New, My Chemical Romance, Armor For Sleep and 30 Seconds to Mars changed our lives and I think are very present in our music. Our biggest influence is triumph. Rising from the ashes is the best feeling and that’s what this band is all about. 8. What image do you think your music conveys? Evan: The image I see is four young men who will not let anything stand in their way. I hope when people listen they won’t let anything stand in theirs. 9. How do you promote your band and shows? Evan: AvionRoe.com is where we communicate to our fans everything we have going on so they can be involved as possible. 10. Describe your show, visual and musically. Evan: Words can’t do that. Come see us. 11. Do you have any shows or tours coming up that you’d like to inform us about? Evan: Our first Dallas show will be South By So What. It is a huge festival on March 17th; we are very excited to play at home. 12. Tell me about your outlook on the record industry today? Have you had any luck with getting signed to a label or have you decided to release all your music independently? Evan: The Art of Fiction was released independently. I think the record industry is far too big to generalize. We just love our fans and making music. 13. You have a music video for the song “Who I Am…” what is the concept behind it? Evan: The story is that I am trapped in a room, which represents a difficult place in life that i recently faced. My friends all try different tactics to help me out of the room. I end up turning my back on music, that’s what the piano burning represents. I ultimately face myself and my fear and realize who i am. At the end the fear is left alone in the room. 14. What else can we see from Avion Roe? Evan: We are shooting another music video next week for The Difference Between Us, stay on our Facebook to see when its coming out.